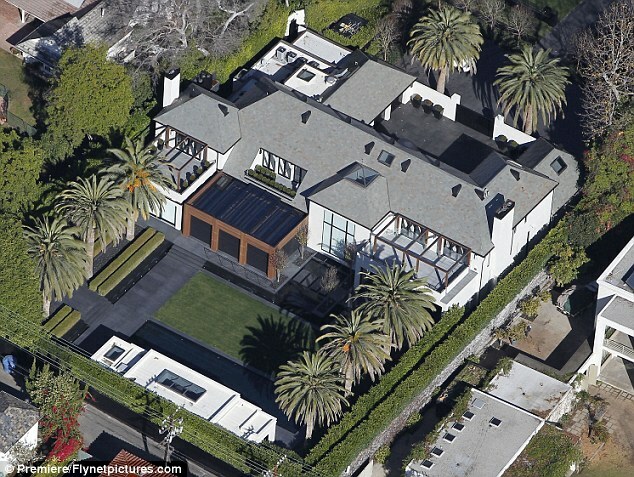 Simon Cowell is reported to be giving his pregnant lover Lauren Silverman a $10 million home in Beverly Hills. The generous music mogul will gift Lauren one of his mansions in order for the 36-year-old socialite to bring up their child in Los Angeles. Lauren is currently based in The Hamptons, near New York where she lives with her husband Andrew and their seven-year-old son Adam. According to a report in the Daily Mirror, the home is situated on the exclusive Trousdale estate in Beverly Hills and 'will be given to Lauren' after her divorce. 'Simon has amassed a lot of houses with his fortune and will want to provide for his child,' a US property source told the newspaper. 'But he seems to give away a house every time he splits from a girlfriend, so he is getting through them more quickly than he thought. It is thought Lauren will live at the property with her mother Carole Saland and her baby. With neighbours including Ringo Starr and Elton John, Lauren will apparently enjoy a 7,265 square-foot home complete with swimming pool and four bedrooms. 'Simon has lots of housing in Beverly Hills all close to each other and now lots of it contain his exes,' a source said. The X Factor judge and his beau are hoping the divorce can soon be settled. Lauren, who is expecting a baby with the music mogul, has held 'productive conversations' with her estranged husband as they continue to thrash out their divorce agreement. And the couple- who spent the weekend locked in talks at their rental home in the Hamptons - are also working on plans to share custody of their son Adam. Meanwhile, it has been reported that Simon and Lauren are 'still in a relationship. The 53-year-old X Factor boss and the newly separated New York socialite already have strong feelings for one another as they allegedly began having an affair in 2009. The source added that the couple were originally only hooking up sporadically but they are more serious now that Lauren is pregnant. The brunette beauty is set to give birth in February and Lauren's mother Carole Saland has insisted her marriage was already beginning to unravel when she met Simon at the plush Sandy Lane resort in Barbados. Andrew, who was one of Simon's good friends, filed for divorce last month, naming the music mogul as a co-respondent in papers and citing adultery as the reason for the failure of his marriage. Simon is reportedly excited to become a father for the first time, but is giving his married lover - who is 11 weeks pregnant - space in order to reach an agreement with Andrew.